Today is my blogging day on Inkspot., the blog for the authors of Midnight Ink. And it seems only fitting at the end of my book launch to thank some of the great people who have helped me make it such a success. Even better–I have never met any of these people in person! Thanks all! Next week I’ll be back to my normal yoga blog! This entry was posted in Downward Dog Mysteries, Gratitude, writing on January 26, 2015 by Tracy Weber. Missi Svoboda Re-enacts the cover photo of A Killer Retreat! Reviews from Mystery Blogs: Check out the fun reviews from posted by the bloggers below: If you’ve seen any that I haven’t please let me know! Guest articles and interviews: In addition to this blog, I’m contributing guest articles to other blogs in the upcoming weeks. The ones below posted in the past week. Radio Interview on My Mama’s Kitchen (Aired Tuesday, January 13) This interview was special because it spoke primarily about yoga and why I love it so much. 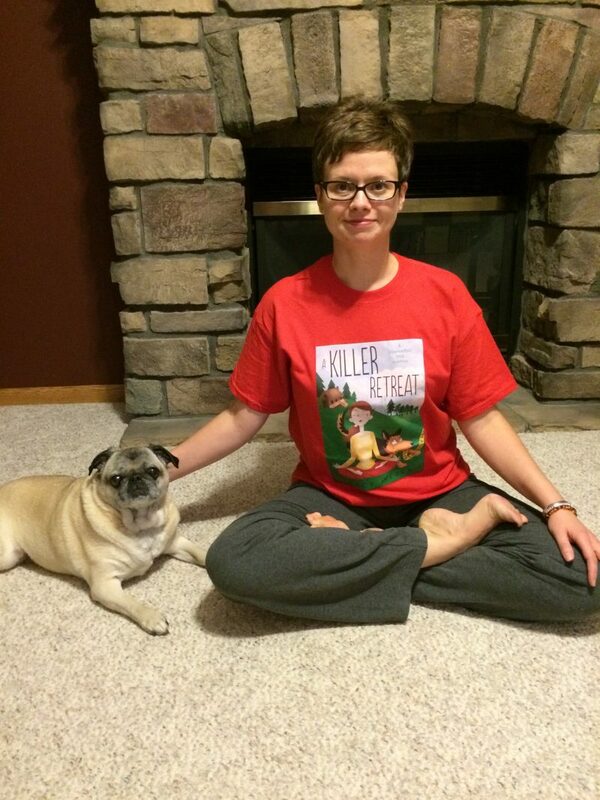 Kelly P’s Blog: Yoga for Mystery Readers. 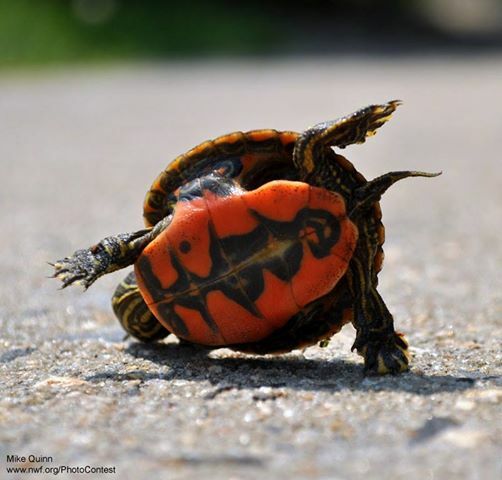 Yoga is good for everyone! In this article, I discuss the key benefits of a consistent yoga practice for mystery readers. More upcoming events: If you’re in the area, come see me! This entry was posted in dogs, Downward Dog Mysteries, writing, Yoga Books and tagged A Killer Retreat, Cozy, cozy mysteries, cozy mystery, dog mystery, downward dog mysteries, downward dog mystery, Tracy Weber, writing on January 19, 2015 by Tracy Weber. A Killer Retreat Book Launch Week 1: So far, so great! Fiona had to wait so long for the book launch that she outgrew her shirt! Reviews from Mystery Blogs: Check out the fun reviews from posted by the bloggers below: If you’ve seen any reviews that I haven’t listed here please let me know! Interviews: I’m continually surprised by the diversity of questions I get asked by interviewers. There’s a tiny bit of overlap in the interviews below, but not very darned much. I’ve highlighted some of the unique questions in each. Mochas, Mysteries, and Meows: This one is a lot of fun, because I got to write it from Bella’s (The German Shepherd in my series) point of view! Edmonds News: Artfully Edmonds: This local arts columnist asked some great questions about how to “make it” in the writing business. Truth be told, I haven’t made it yet. But if I ever do, it will be because of support from readers like you! Christa Reads and Writes: In this one, you can read about my yoga teacher/sleuth Kate and how she compares to me. Spoiler Alert! We have some similarities! Thoughts in Progress: Learn about my writing process (or lack thereof, if the truth be known). I’m not exactly known for my organized desktop. 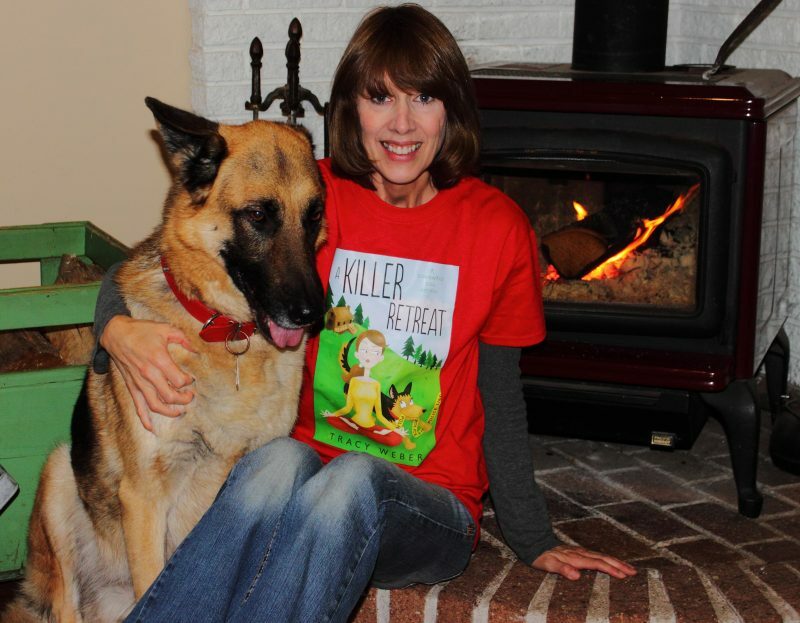 Cozy Up with Kathy: This interviewer asked me to talk about my work, of course, but also two other topics in the series I feel passionately about: EPI (the digestive disease my own dog has) and reactive dogs. Omnimystery News: This interviewer asked lots of fun questions about my life, my characters, and my genre. My favorite question, however was to complete this sentence… I am a mystery writer and thus I am also… How do you think I answered it? Radio Interview on Conversations Live with Cyrus Web. Cyrus hosted me on his program last launch and it was a thrill to talk with him again this year about my new book, getting to know my characters and encouraging other writers. Guest articles: In addition to this writing blog, I’m a contributing author for several other blogs in the upcoming weeks. The two articles below posted in the past week. Writers and Other Animals: This is actually an excerpt from the book—a scene in which Kate discovers Suicide Bluff, an area that will later become much more frightening than she could ever imagine. Sequence Wiz: Read about finding your passion by sharing yoga in unusual ways. Upcoming events this week: If you’re in the area, come see me! The party at Whole Life Yoga will feature champagne, killer cake, and lots of door prizes! Thanks all! Have a great week and I’ll give you another summary next week! This entry was posted in dogs, Downward Dog Mysteries, writing and tagged blog tour, Cozy, cozy mysteries, cozy mystery, dog, dog mystery, dogs, downward dog mysteries, downward dog mystery, Karma can be Killer, Tracy Weber, writing, yoga, yoga mystery on January 12, 2015 by Tracy Weber. Please join me for one, several, or all of the events below! And please support these booksellers who have gone out of their way to support me! Thursday, January 8, 5:00 – 7:00 PM PST. Facebook launch party! Many of my readers aren’t in Seattle, so I’ve decided to host a virtual launch party this year. I’ll be posting photos of settings in the book, offering excerpts, giving away a prize every 15 minutes, answering reader questions, and accepting virtual hugs. To join in, Click on this link. Please also share with your friends. The more the merrier! Saturday, January 10, noon – 1:00. Seattle Mystery Bookshop in Seattle, WA. A low key meet-and-greet event. But you don’t want to miss the opportunity to check out this Seattle landmark that devotes its shelves completely to mysteries. Tons of fun! Thursday, January 15, 5:00 – 8:00 PM. Edmonds Book Shop in Edmonds, WA. I loved being part of the Edmonds art walk last year, and this lovely local book store is a community favorite. I’ll be hosting some drawings for book-related goodies. Saturday, January 17, 2:30 – 4:00 PM. Whole Life Yoga in Seattle, WA, co-sponsored by the University Bookstore. This one is going to be a PARTY! Cake, bubbly, yoga discounts, prizes, and readings. We’re going to have a blast! Thursday, January 29, 7:00 – 8:00 PM. Third Place Books in Lake Forest Park, WA. I had a great time in this open and inviting venue last year. I plan to offer a short chair yoga practice to liven things up, a couple of readings, Q&A, and tons of prizes! Not to be missed. Saturday, January 31, 12:30 – 2:30 PM. Costco in Shoreline. And you don’t even have to buy the book in bulk! 😉 Costco offers great prices and I’m thrilled that they asked me to come and do an event with them. This will be another low key meet and greet, so feel free to come on by at any time during the event and say hi! Friday, February 6, 6:00 – 7:00 PM Garfield Book Company in Tacoma, WA. This will be my first event at the bookstore at Pacific Lutheran University. In addition to reading, I’m going to offer a class on yoga for students and other readers. Please let all of your south end friends know! Saturday, February 7, 1:30 – 2:30 PM. Page 2 Books in Burien, WA. Another fun new venue for me, in which I plan to tease the audience with readings, prizes, and maybe a yoga pose or two. Saturday, February 14, 1:30 – 2:30 PM. Barnes and Noble in Federal Way, WA. I hope to see some of my old buddies from Weyerhaeuser there! Grab your honey and prepare to have a “killer” of a time! Sunday, March 8, 4 – 5 PM. Village Books in Bellingham. Bellingham has a large viniyoga following, so I’m totally thrilled to go back there and share my second book. I’m still firming up the plans, but I hope to have a local yoga teacher co teach this with me. Friday through Sunday, March 12 – 15. Left Coast Crime in Portland, Oregon. This fun fan convention is offered once a year. My panels and signings aren’t confirmed yet, but if you plan to attend, please hit me up for a drink! Saturday, March 21, 2 – 3 PM. Barnes and Noble, in Billings, MT. What a complete and total hoot to be signing books in my hometown. I’ve invited another mystery author to join me, but I don’t want to jinx it so you’ll have to check with me in a few weeks to see if she can come. Readings, giveaways, and of course signings galore! Saturday, May 9, 2 – 3 PM. Barnes and Noble, in Bellevue, WA. East side moms take note! What could be better than a little “spa day” relaxation with A Killer Retreat! I have to admit, typing this all out just gave me heart palpitations. It’s going to be a BUSY few months! Add to this three radio shows, ten guest articles, and seven interviews scheduled—so far—and I may never sleep again. Please come see me at one of the events, give me a big hug, and let me draw from your energy. And always, of course, come see me us at Whole Life Yoga! Thank you for your support! 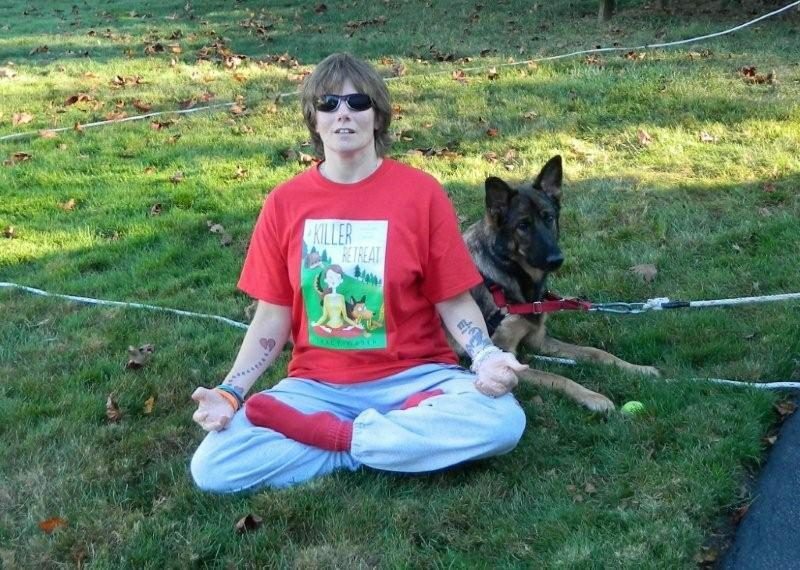 This entry was posted in Downward Dog Mysteries, writing, Yoga Books and tagged A Killer Retreat, blog tour, Cozy, dog, dogs, downward dog mysteries, Tracy Weber, writing, yoga mystery on January 5, 2015 by Tracy Weber.